Bezmer Air Base (IATA: JAM, ICAO: LBIA) is an air base for the Bulgarian Air Force. The base is situated in the eastern part of the Upper Thracian Lowland, in Yambol Oblast (Region), 10 km west of the city of Yambol and 30 km southeast of the city of Sliven, between the villages of Bezmer andBolyarsko, and near the Sofia-Burgas railway. The base takes its name from the nearby village, which is named after Khan Bezmer of Bulgaria (7th Century AD). The strategic location and particularly favorable weather conditions of the area was appreciated already during World War I, when the Imperial German Air Service built in Yambol a base for zeppelins used for reconnaissance and bombing missions to Romania, Russia, Sudan and Malta. In 1955 the Bezmer Air Base hosted the 22 Fighter Air Regiment, later transformed into 22 Fighter-Bomber Air Regiment, and eventually into 22 Attack Air Base of the Bulgarian Air Force, serving as a base for Su-25 ground attack aircraft, as well as Su-22M-4 and Su-22UM-3K reconnaissance planes. Aircraft and personnel from Bezmer have recently been participating in a number of joint military exercises including the PfP ”Cooperative Key” in Turkey, Bulgaria, Romania and France, �Immediate Response 2005� and the Bulgarian-American-Romanian ”Immediate Response 2006″. The base has a modern communication, information and navigation system. A second phase of modernization and infrastructure development is underway, including a runway extension, which would expand the range of planes the base can support. 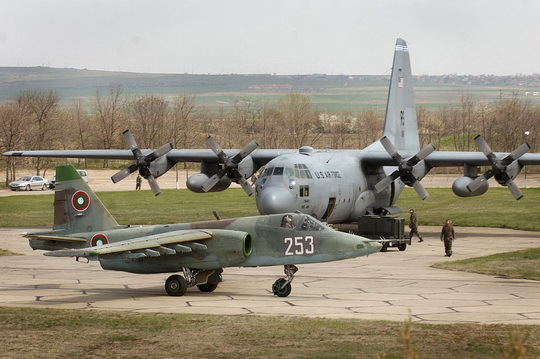 The Bezmer Air Base is among the joint US-Bulgarian military bases established according to the 2006 Defense Cooperation Agreement between theUnited States and Bulgaria. Some experts rank Bezmer among the six most important American military bases outside mainland USA.